Discovering India in Hong Kong - Your Shift to Vegetarianism? If you’re not a vegetarian now, these two Hong Kong Indian restaurants will certainly open your eyes to the possibility! After even a single trip to either Woodlands or Sangeetha, we’ve seen even the most staunch meat eaters ask for seconds of these veggies! 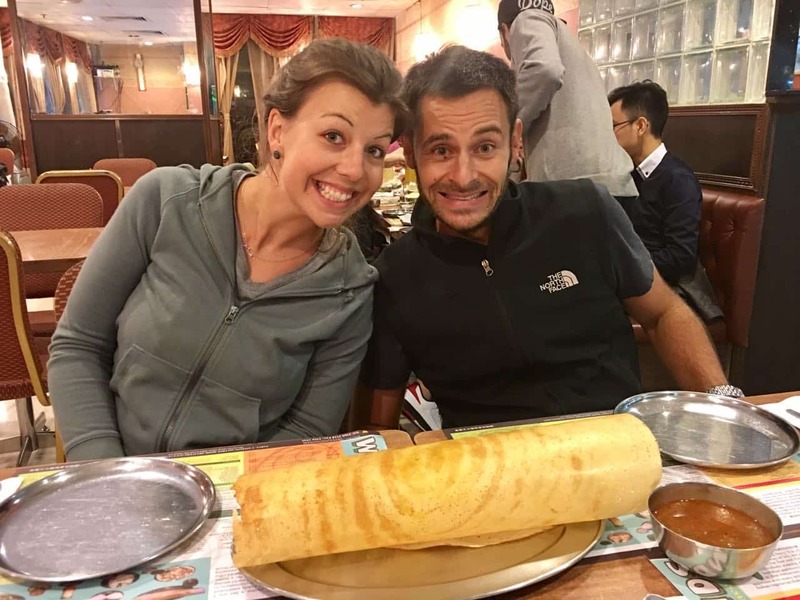 With a wide variety of south and north Indian dishes, discovering India in Hong Kong by way of these two GEMS, is certainly going to be a tasty task. 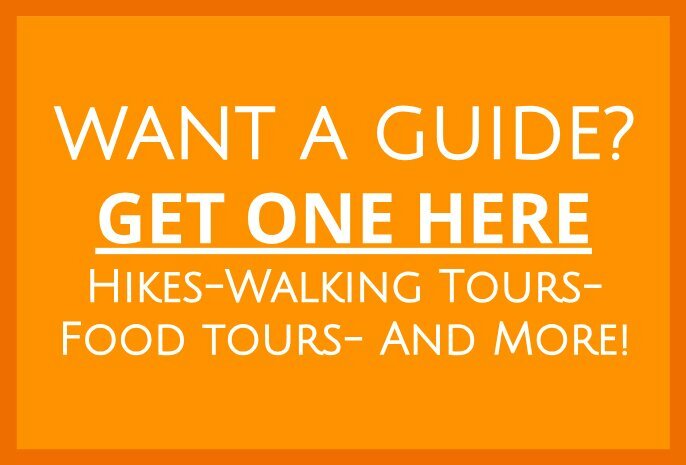 We hope you try it on your own! Both of these pure-vegetarian restaurants are addictively delicious, and since they are both conveniently located on the same floor in the same building, you can try out both and discover all the culinary treasures at each. And, although you’ll notice both Woodlands’ and Sangeetha’s menus are quite similar, after our over 25 visits between them both, we’re convinced each restaurant makes certain dishes particularly well. Try both of them out for yourself! And, when you find your own favorites, let us know about them in the comments section below! In the meantime, read on to find out about our favorites, and rest assured, no matter which restaurant or dish you try first, you’ll instantly be craving more! Both of these places are GREAT! From dosa to thalis, to uttapam and more, at Woodlands, we have never have a problem finding something delicious, healthy and thoroughly satisfying. With over 50 menu items, Woodlands’ casual atmosphere allows you to focus entirely on their food. They are only open for dinner, so if you’re craving Indian for lunch or even breakfast, you’ll have to head over to Sangeetha. Here are some of our favorites at Woodlands. 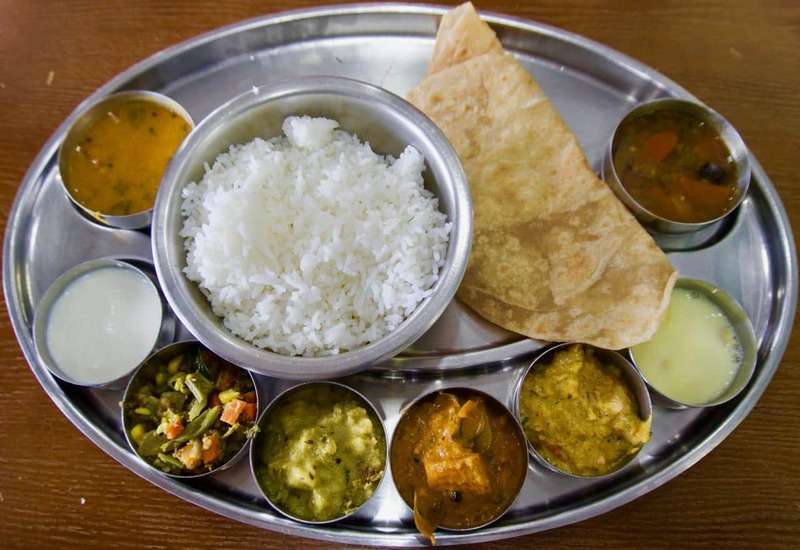 A thali is essentially a tasting platter. It’s large enough for two people or one very hungry person. And either way, at ~HK$100, it’s a steal! On the thali you’ll get five different dishes, one dessert, one portion of raita made with homemade curd (yogurt), rice, and either roti or puri as well as a papadum. Suffice it to say, if you can’t make up your mind about one dish, get the thali and you’ll be able to experience five! That’s what we usually do! The dishes in the thali change daily, so you can ask the waitstaff what’s in the thali on the day of your visit, and you’ll be able to get what you’d like (and avoid what you don’t). In the past, Woodland’s North Indian thali has included curried eggplant, palak paneer, aloo palak, aloo gobi, curried okra, chana masala, dal, and many other dishes too. As an aside, but quite an important one, for only HK$10 each, you can have a refill of any of your tasting dishes. Be careful not to get overstuffed! Dosa is another one of our favorite dishes, and Woodlands does them exceptionally well. Basically, dosa is the Indian version of a Crêpe. Dosa are made from fermented rice and lentil batter. They are thin, light, crispy and at Woodlands they have a richness in flavor that is nearly impossible to replicate at home due in large to the fact that Woodlands cooks their dosa on their age old and well seasoned dosa griddle. Woodlands offers dosas with a number of different fillings. Our favorite is the Masala Dosa. And, don’t be intimidated when your dosa arrives at your table. Woodlands’ dosas are about the length of my arm and the width of my thigh, but don’t worry, one person can handle one on their own. Woodlands’ dosas also comes with a bowl of sambar and some coconut chutney, so make sure to try dipping your dosa around! Take the MTR to East TST station or TST station, and exit the MTR using exit P1. Once you’ve exited the MTR and you’re on the street, look to your right for the Wing On Shopping Plaza. Go inside the nearest entrance. Ride the escalators up one floor. At the top of the escalators, turn to your right a little more than 90 degrees, and you’ll see Woodlands! 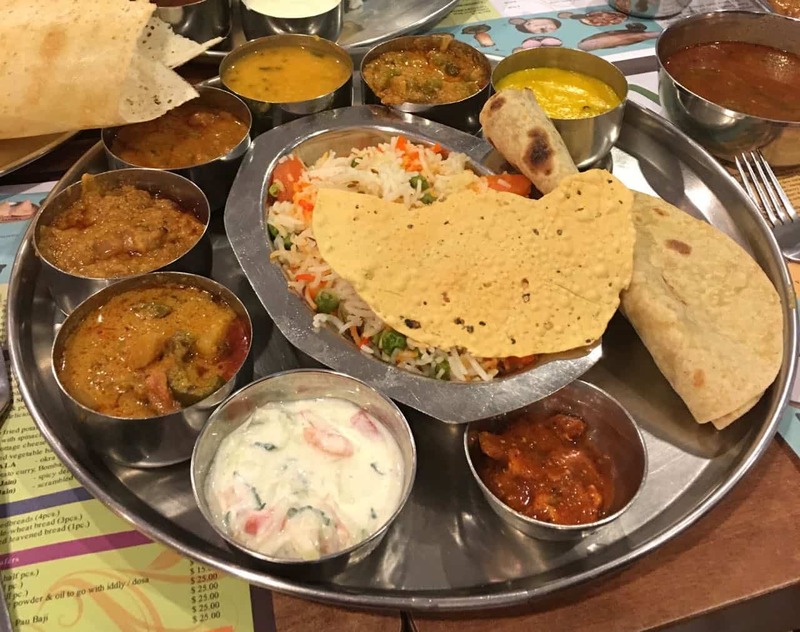 If you’re keen to continue discovering India in Hong Kong, we suggest you check out Sangeetha. Aside from Sangeetha’s mouth watering South Indian food (we’ll get to that in a minute), Sangeetha is open nearly all day, everyday (see Sangeetha’s website for their specific hours). So if you are craving curry for breakfast (which on occasion we do), lunch or dinner, this is your place! Here are some of our favorite items at Sangeetha. After many a taste test, we have come to LOVE Sangeetha’s South Indian thali. Again, this is a great choice if you’re looking to sample a number of different dishes. Just like Woodlands, this is large enough to split between two people and will leave one person feeling very full. This thali contains different types of poriyal, kootu and kuzhambu, so again, make sure to ask what they’re serving that day, and rest assured, no matter what they’re cooking up when you go to Sangeetha, you’re going to LOVE it! Now I know you’re thinking, “Salt in a lassi?”. And indeed, while Sangeetha does serve both mango and sweet lassis, we have come to CRAVE Sangeetha’s salt lassis. Not only are they quite hydrating, but Sangeetha’s lassis are savory, lusciously rich and creamy, and from the first sip, they will leave a think coat of milk fat on the top of your mouth. 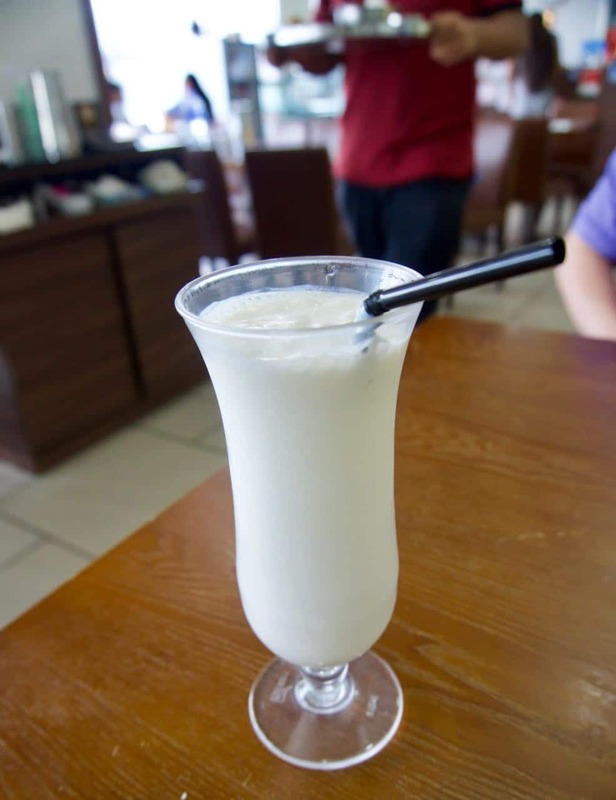 If you don’t prefer your lassi to be so rich, you can ask for an empty glass, cut your lassi with a bit of water, and share it between two people! Even watered down, Sangeetha’s lassis are smooth and DELICIOUS! Take the MTR to East TST station or TST station, and exit the MTR using exit P1. Once you’ve exited the MTR and you’re on the street, look to your right for the Wing On Shopping Plaza. Go inside the nearest entrance. Ride the escalators up one floor. At the top of the escalators, look for the Sangeetha sign slightly to your left, walk towards the sign, and then continue walking beyond the sign in the same direction. Take your second right, and you’ll see Sangeetha on your left. If you didn’t already know it, global meat consumption and production is the number one contributing factor to global warming. By eating the pure-veg food at either of these places, you’ll be making yourself happy and our planet too. And if you’re keen to get on a live-greener roll, you should check out our guide to living greener in Hong Kong. In 10 little suggestions, you’ll be making the world a happier place for everyone! Discovering India in Hong Kong for Yourself! So there ya have it! Two fantastic Indian restaurants in the same building! We hope you try them both, and that when you do, you leave us a comment below with your favorite finds! 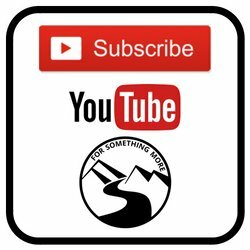 Get out there and explore! And if your looking for other Hong Kong culinary gems, check out our piece on Hong Kong’s wet markets!